Exercise toys help little pets get the physical activity they need to stay healthy, and they also provide mental stimulation to relieve boredom and prevent them from developing destructive habits. See examples of different types of exercise toys you can swap out frequently to keep your pet's environment fun and stimulating. Exercise wheels are the staple of most small pet habitats. They're stationary toys designed to fit inside a cage, but they still provide pets with as much mileage as they can handle. There are two basic types of wheels - upright or flat. The Super Pet Run-Around is a good example of an upright exercise wheel. It's made of metal, so it's chew resistant. The mesh design of the running surface keeps your pet's feet and tail safely inside the wheel. For the greatest stability, attach the wheel to the side of the cage. If you find it too squeaky, just apply a little vegetable oil to the axels. This wheel is available in three sizes. The Flying Saucer exerciser literally puts a new spin on wheel toys. The saucer lays almost horizontal and operates more like a merry-go-round. This makes it a little easier for more than one pet to join in on the fun. The wheel is solid, so your pet's feet and tail are protected from injury. It's also quieter than the average metal hamster wheel. Put an exercise wheel in a toy car, and what you wind up with is a good time for everyone. It's really comical to watch a hamster cruise around in his own sports car, and he's bound to appreciate the change of scenery. Habitrail's Playground Dragster gives your little pet more freedom to move around the room on his own while safely encased in his wheel. The dragster basically moves in a straight line, but it can go backwards and forwards depending on which way your pet faces when he runs. The car operates best on a smooth surface, and it's definitely more difficult to drive on a carpet. It's mainly designed to fit mice and dwarf hamsters, but it may be just large enough to fit a Syrian hamster if he's not overly chubby. The Critter Cruiser is designed to work for hamsters, mice and gerbils. The car is very lightweight, so your pet doesn't have to strain to move it as long as he's on a smooth, flat surface. Putting the wheel in the top setting keeps the car stationary, much like a regular wheel. Dropping the wheel down into the middle position allows the car to roll along as the hamster makes the wheel turn. The lowest setting is designed for running the car around the optional Hamtrac that can be purchased separately. Exercise balls are designed to give pets the freedom to roll around on their own while protected inside a safe environment. These balls generally twist open so you can place your pet inside, and then carefully twist the unit shut and place it on the floor. Each ball has numerous air slots so your pet can breathe easily. As with any type of rolling toy, make sure that stairs and other drop-off points are blocked for your pet's protection. You can get an ordinary small exercise ball, or you can opt for this adorable helicopter set. This ball is sized for mice and dwarf hamsters. It's the perfect place to let your little pal play while you're cleaning his cage. 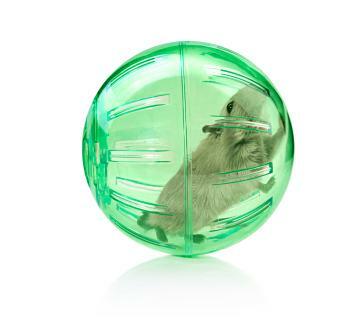 Ferrets, chinchillas and Guinea pigs won't be left out of the fun with this Mega Run-About exercise ball. The smaller animals can run the ball from the inside, while ferrets may prefer to push it around and chase it from the outside. Balls aren't just for dogs. Small animals enjoy playing with them, too! The Buffet Ball exercises a pet's brain, as well as his body. He has to roll the toy around and figure out how to extract the blades of hay and timothy so he can munch on them. This ball is designed for rabbits, ferrets, Guinea pigs and hamsters, and pets will get the most use out of it when playing outside their cages. Marshall's Woven Grass Play Ball gives rabbits, ferrets and Guinea pigs a chance to chase and play. The ball is especially enticing since it's completely edible. It's a great toy to use outside of the cage so your furry pal can get some extra exercise. Burrowing is a natural activity for rodents and many other small pets. It satisfies their need for activity, but burrowing deep also provides them with a sense of security, which is good for their mental health. Doctors Foster and Smith sell a Dig Box especially for ferrets. It's nothing more than a large cardboard shipping box filled to the top with non-toxic, starch packing peanuts, but ferrets can dive in and exercise their urge to dig and tunnel without doing any damage around the house. You may need to pick up stray peanuts and put them back in the box, but it's worth it to see how much fun this activity is for your pet. The CritterTrail Burrowing Maze is designed to attach specifically to the top of the company's Clear View habitats, but you can also use Fun-nel Tubes to adapt the maze for use with some of the company's other habitats. The CritterTrail Puzzle Playground is a multi-piece set that you can assemble into a climbing toy for your pet. You can change the assembly to create any configuration you want, and you can buy additional sets to make the playground as big as you like. The sets are a little difficult to put together, but customers say they are very sturdy once they're finished. Exercise is certainly good for your pet's mind and body, but you shouldn't allow him to play to the point of exhaustion. He can stop playing with most of the toys listed here when he grows tired, but limit his use of the enclosed toys like the exercise balls and vehicles to 10 or 15 minutes at a time, and then put him back in his cage. Keep an eye on him while he's playing and rotate his toys on a regular basis, and he'll stay active, engaged and healthy.